Dr. Jessica DeAcetis grew up in Cold Spring Harbor, NY. Her first dog as a child, a West Highland White Terrier, was in fact a patient of West Hills Animal Hospital many years ago. She earned her undergraduate education at Boston University and her veterinary education at Western University of Health Sciences in Pomona, CA. 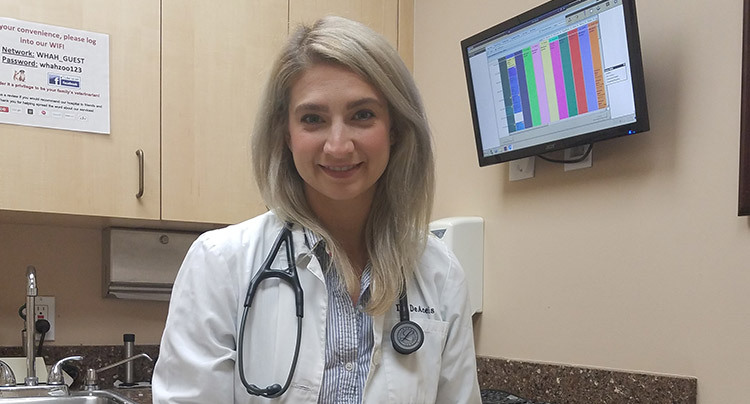 After graduating, she completed a one-year general medicine and surgery internship, followed by a one-year small animal surgery internship at Long Island Veterinary Specialists in Plainview, NY. Since then, she has worked in both emergency medicine and in general practice. She is also a graduate of the Chi Institute Small Animal Acupuncture program. Dr. DeAcetis currently shares her home with a black domestic shorthair cat named Chloe and a rescue pit mix named Mildred!